Do you remember when I told you about the wonderful cords, that Amy sent me? Well, last night I cut into some of it. 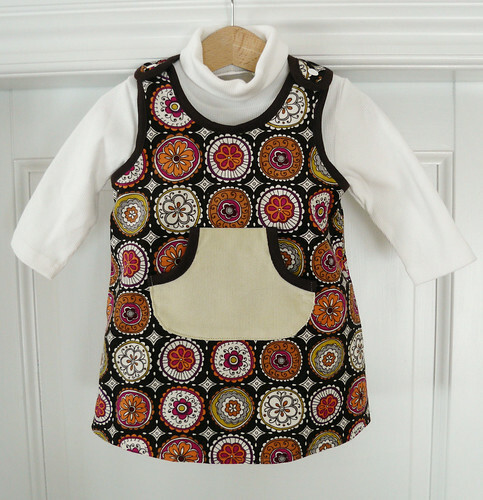 I made the “Nasta” pinafore dress once before, and I thought it would be perfect for this wonderful retro print. Also, last time I made it, I actually traced it one size smaller in length to make sure she would be able to crawl in it. However, now that she’s walking most of the time, I think it’s ok for her to have it dress length. I still really like this pattern – I was totally unsure of what colour to go with for binding and pocket, but I think this works nicely – I’m actually quite fond of this one! expires tonight Danish time – I believe in about 5 hours. This entry was posted in Sewing and tagged #3, 04/08, 04/2008, baby cord, binding, corduroy, dress, fabric, jo-ann, kjole, nasta, ottobre, ottobre design, pinafore, pocket, printed cord, retro, Sewing, size 80, snaps, sy kjole. What a groovy fabric 🙂 and nice simple pattern. Orange binding would have been more retro but I like this one better. Nice work indeed! jeg er ret ny her på din blog,synes du laver nogle rigtig fine ting. Hvor er den bare feed!!! Det er en forklædekjole ikk? This is just adorble. 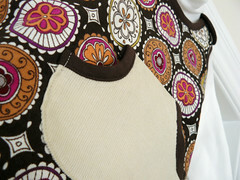 Great job on the binding and love the contrast pocket. Oh, I love the fabric and the pattern 🙂 ! Hvor er den skøn! Fantastisk stof! Gorgeous. I love the fabric, the pattern and the wonderful job you did. I am sure it will look great on Frida. 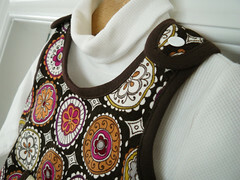 Wow, the fabric is fabulous made up in that pinafore. Lovely work as per usual! I cannot wait to see it modeled on Friday! These colors will be fantastic on her. Gorgeous work, as usual! Maria – you’re right about that – I do think, though, that orange would have been a bit too much for me. 😉 Thanks! Helinä – thanks, you’re sweet! Karen – Friday – wasn’t that the name of Robinson Crusoe’s friend? LOL – I’ll get her to model it soon! Som altid en fantastisk kjole du må simpelthen have instinkt.